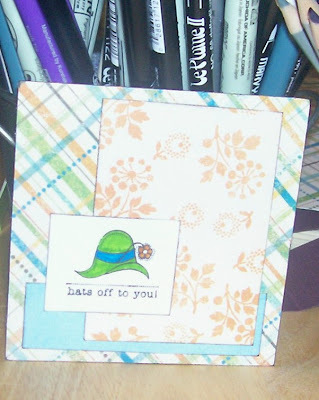 Confessions of a 20-something Scrapbooking Mother: Hats off to you! Here's a card I made for Angel's Day #9 sketch! I'm definitely going to be doing more sketches from now on. I can't believe I've went so long without doing so-I feel like I've been missing out on some big secret! All the PP are MME from my scraps! I used scraps again! YAY! The stamp is Lizzie Anne Designs. Isn't it cute? I really like this card! Great job on using scraps. I never would have known! This card is so cute!